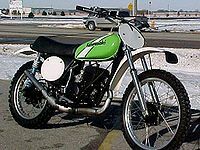 The Kawasaki KX250 was a 250cc, off-road motorcycle and motocross motorcycle manufactured by Kawasaki from 1974 through 1976 and again from 1978 through 2007. 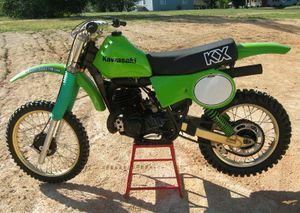 Kawasaki did not produce production motocross machines for the 1977 model year, as their previous version had been proven obsolete by the introduction of long-travel suspension by Kawasaki's competitors, most notably the Suzuki RM250A. 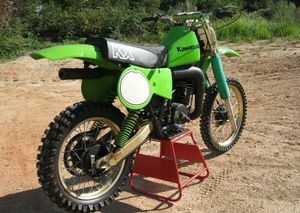 Kawasaki returned in 1978 with a limited production and totally revised KX240A-4. 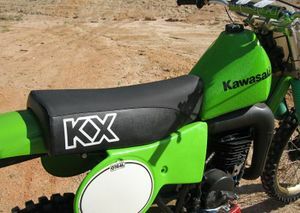 The 1980 KX models were the first to use a modern single-shock rear suspension. 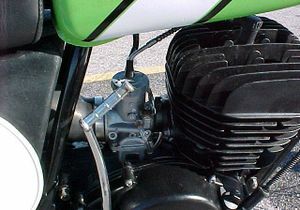 Water-cooling and front disk brake were instituted with the 1982 models. 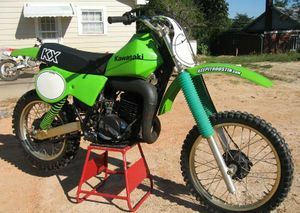 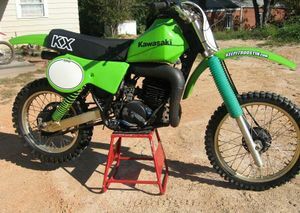 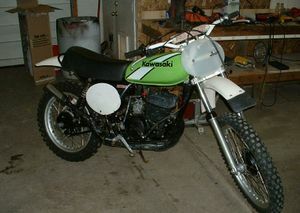 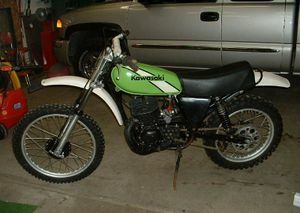 The KX250 introduced in 1974 was Kawasaki's first serious attempt at a production motorcross bike. 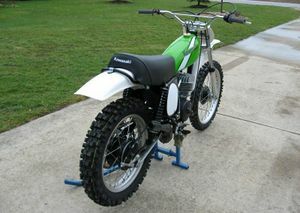 This differed from their earlier efforts in that it wasn't an offshoot of a mainly enduro themed machine. 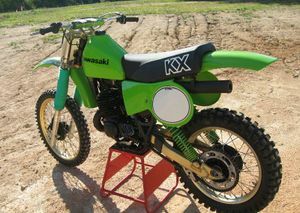 It began a line of production motocrossers that are highly respected for their strength and competitiveness. 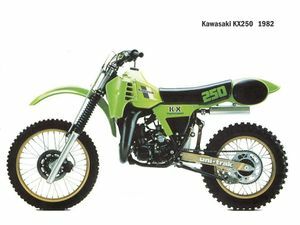 Kawasaki has always followed a route of continuous development for their KX series lending them to always be competitive and for the speed at which factory racing developments make it into the production machines. 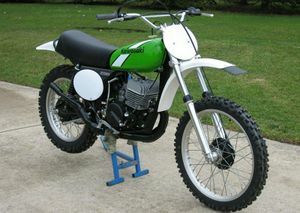 The first KX250 was based largely on Jimmy Weinert's 1973 machine. 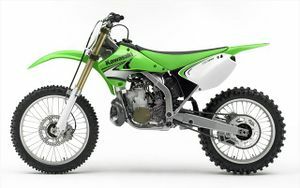 Small cylinder bore increase to 70mm, electrofused cylinder walls, sealed nitrogen filled rear shock absorbers with long travel. 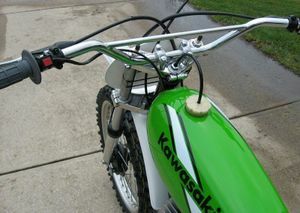 New front hub design. 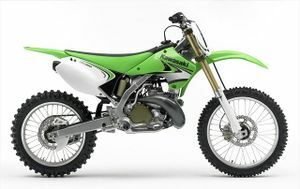 KX250A4 Featured gold-anodized aluminum swingarm and wheel rims. 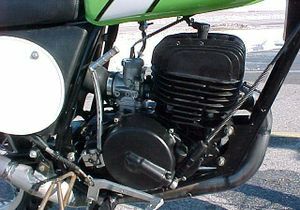 70 x 64.9mm engine featuring reed valve induction and a 7.6:1 compression ratio. 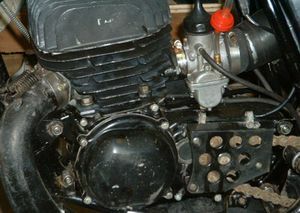 Mikuni VM38SS carburettor. 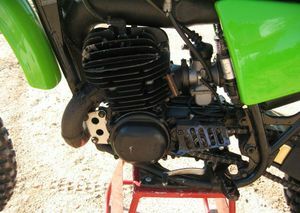 Maximum power of 40bhp @ 8,000 RPM. 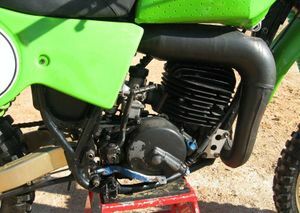 Kayaba front forks. 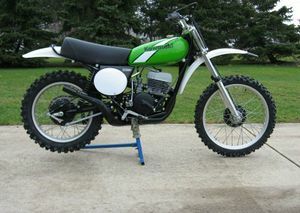 remote reservoir rear shocks with 9in of wheel travel. 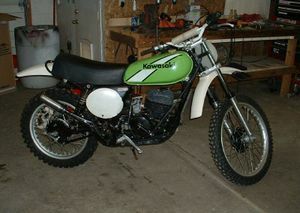 Total redesign including frame and a new plastic tank. 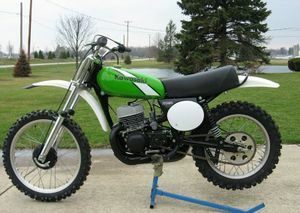 Offered 11in of wheel travel. 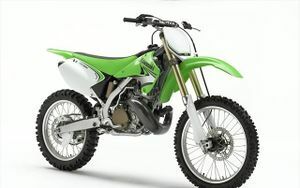 Also Kawasaki introduced a derivative of the KX250 in the form of the KDX250A. 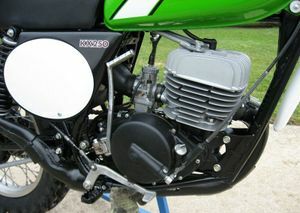 Power increased to 42.5 bhp @ 7,500RPM. 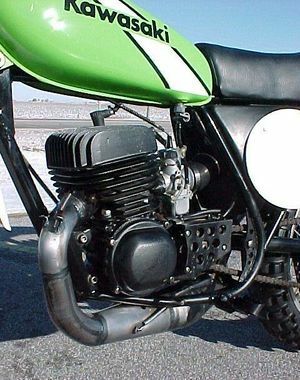 Featured a 220mm front disk brake.